For her first major survey solo exhibition at a public gallery in the UK, Rebecca Warren has arranged a mise-en-scène comparable to one of her ‘vitrine’ works. The exhibition, like her work, builds its own ontological framework in which elasticity, imagination, narrative and a sense of incompletion are its constitutive elements. Within the exhibition, a collection of Warren’s vitrines are grouped together. Subverting the classic museological cabinet, they hold such detritus-treasures as wood shavings, Blu-tack and lumps of polystyrene, ephemera that provoke questions of intention and deliberation to the point that even a layer of accumulated dust is given belated, though ambiguous value. The precarious and contingent state of Warren’s sculptures, and the confused hierarchy of their elements, is essential to the viewer’s experience of the work. Perhaps that is why Warren’s objects are so impossible to pin down; their coming into being as ‘art objects’ is less a priori than it is a state of unfolding, or of constant arrival. To illustrate, the monolithic clay sculpture in the Serpentine’s central rotunda, ‘AC/DC 2’, 2003-09, could still be unfinished, yet this unfinished status constitutes its character and then paradoxically, its finality. The art historical references and/or the gender politics evoked by the work, are also slippery ingredients, as illustrated by three new steel sculptures. Referencing Richard Serra’s work, these sculptures are not reducible to their antecedents, rather they emerge from their source, and move beyond it. Warren fixes her trademark pompoms to the bodies of these sculptures, which, like oxidised thumbprints on polished copper, seem to be saying ‘…this is my mark… this thing is mine now’. However, Warren is not anchored to, nor preoccupied with, her moment of reclamation. 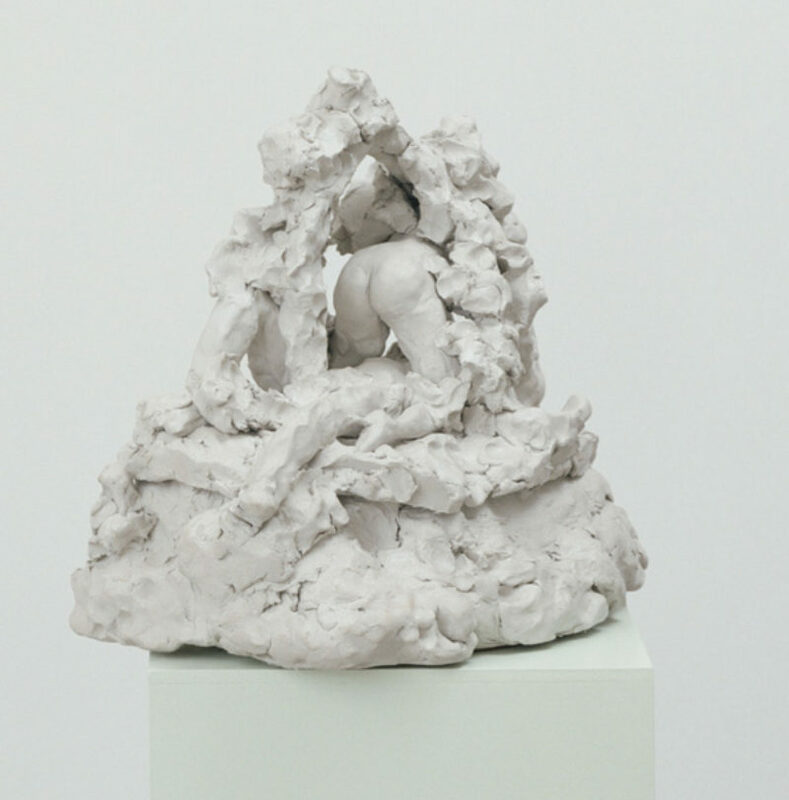 Described in the exhibition catalogue as a turning point in her career is the clay sculpture ‘Helmut Crumb’, 1998. The work consists of an outer pair of legs joined by a genital bulb, into which a stylised vaginal groove is cut. Between the hoof-like feet of this figure, is its offspring. Built from another pair of legs beneath a misshapen belly, this smaller figure seems about to topple, thanks to the appearance of ropes or undergarments around its knees. This sculpture is not an innocuous evocation of ‘Woman’, for it hints at an iconography that encompasses seaside postcards to degraded media images; there is even something peculiarly British about it. In fact, ‘Helmut Crumb’ makes literal reference to the photographs of Helmut Newton and a cartoon by Robert Crumb named ‘Girls, Girls, Girls’. The somewhat deprecatory imagery behind ‘Helmut Crumb’ is not Warren’s invention, but as with so many of her sculptures, she has transformed and ameliorated her source material. Two formally similar works, ‘A Culture’, 2008 and ‘The Other Brother’, 2008, invoke the spirit of Brancusi’s uprights. Peculiar stylisations of the feminine body, these tall and bulbous shapes are also heirs to the imagery of Crumb’s cartoon, but unlike Crumb’s drawings, are generous and exultant. Warren does not linger at her moment of reclamation, and her work is not reducible to that which it comes from. Therefore, it would be mistaken to name these shapes as ‘Woman’, but it is important to identify with the elements of woman within them. The contemporaneity of Warren’s work is its particular success. In her catalogue interview the artist expresses the near crippling nerves she felt early on in her career beneath the weight of her often-cited precursors. She describes a desire to avoid copying, and to find her own way, a message she conveys clearly in this Serpentine show.